BOURNE, Mass. 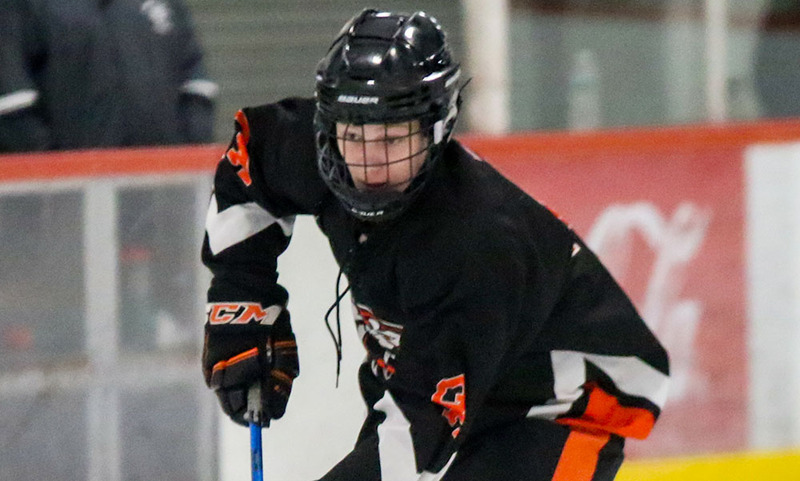 – Coming into the month of February, Oliver Ames junior defensemen Ryan Gottwald was in search of his first career goal. That came just over a week into the month in a big win over Brockton. Now he can add a game-winning goal in a playoff game to his resume. 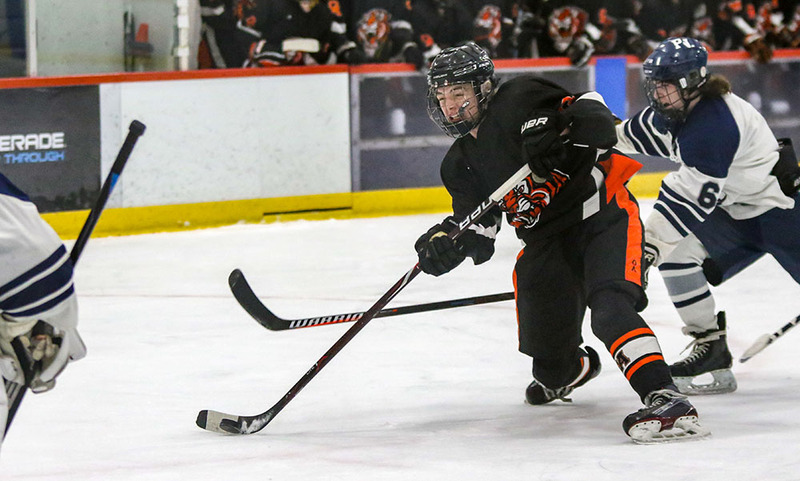 Gottwald scored his second career goal just over two minutes into the third period, and that tally proved to the be the game-winner as the ninth-seeded Oliver Ames boys hockey team skated to a win over eighth-seeded Plymouth North. “I honestly was trying to pass it out front, I was just trying to throw it to the middle and I was surprised when it went in,” Gottwald said. “I pinched in because the puck was open so I went down and got it and was just looking for someone out front and I think it went five-hole. Neither the Tigers or the Eagles could find separation for the first 25 minutes of the contest, with Plymouth North twice answering goals from OA to tie the game. And after four total goals in the first period, neither team could get an edge in the second, not until the final minutes. Oliver Ames bookended the end of the second and beginning of the third with goals, which proved to be the difference in the game. After a strong second period, the Tigers were rewarded with a goal with just over a minute left in the frame for a 3-2 lead. And then Gottwald opened the third with a low shot that found its way in to make it 4-2. Plymouth North cut the deficit to one with 2:38 when the puck was deflected from behind the net to right in front for a tap in. The Eagles pulled the goalie with just over a minute left but junior goalie Owen Connor made two big saves in the final minute, and senior Cullen Gallagher – making his return after missing a majority of the season to injury – made a terrific effort play with a diving clearance to help the Tigers kill the final seconds. Connor finished with 35 saves, making 11 stops in the first period, 12 in the second, and 12 more in the third period for the win. Oliver Ames got off to a perfect start, scoring just 1:13 into the contest. Jake Gottwald, Ryan’s twin brother, came flying in and forced a turnover, intercepting a pass at the Eagles’ blue line. Jake Gottwald went in alone on the goalie, firing a wrist shot that was stopped but the rebound fell right back to him and he buried the chance. The lead lasted just over two minutes as the Eagles were able to establish an offensive zone presence, and Jake Fleet tossed a puck on net that took a wild deflection and found the back of tenet to make it 1-1. Oliver Ames went back in front, capitalizing on its first power play chance of the game. Junior Hunter Costello was extra patient with the puck on his stick, and was able to fake the defense by making a move behind the net. Instead, Costello came back to the left and found senior Max Ward flying in and hit him for a one-timer for a 2-1 lead with 4:58 left in the first. Plymouth North once again had an answer just over two minutes later. Cam Caraher came up with a bad giveaway at the blue line from the OA defense, skated across the zone and snuck his wrist shot into the back of the net to make it 2-2. The Eagles earned a power play chance five minutes into the second and appeared to have the go-ahead goal, celebrating as if that was the case but the ref had blown the whistle before the puck crossed and the game stayed 2-2. In the remaining time on the power play, Gallagher came up with a big clear and Connor made a terrific stop on a redirected shot. At the midway point, the Eagles’ Jason Norwood had a partial break, going in one-on-one with OA’s Julian Krowski, and the Tiger junior won the battle, sweeping away the puck to prevent a chance from the Eagles. OA nearly went back in front with 5:20 left in the second when Costello connected with Gallagher in front but Plymouth North goalie Jack Arnold made a terrific left-to-right push to rob Gallagher. Freshman Bryan Kearns had one of the best chances of the frame for Oliver Ames, skating in on a partial breakaway with a defenseman riding his back. He unleashed a hard shot that Arnold got just enough of up high to keep it out. While Kearns’ bid was turned aside, the Tigers cashed in on the ensuing face-off. Brett Williams and Gallagher linked up with Costello, who turned and fired a low shot from the right circle that banked off a Plymouth North defenseman’s skate and into the back of the net for a 3-2 lead with 1:04 left in the second. “We played a very good second period, we started the third well, and the first period was just okay. We did an excellent job killing penalties, especially those two in the third. This is one of the most resilient groups I’ve been around, nothing really fazes them. No matter what happens, they have a quick turnaround. The effort was there tonight, nothing was really pretty tonight but we got it done. At this point in the new season, we did a good job grinding it out. Oliver Ames killed to Plymouth North power plays in the third period. Connor made four saves on the second extra-man opportunity, Ryan Gottwald and Gallagher had clearances, and Colin Bourne pinned the puck in the offensive zone to kill some time. Oliver Ames boys hockey (14-8-1) advances to the D2 South quarterfinal to take on a familiar foe in league rival Canton. The Tigers, who dropped a 5-2 decision to the Bulldogs in the regular season, will renew acquittances with one of their rivals on Saturday at 6:45 at the Canton Ice House. MANSFIELD, Mass. – The Hornets had enough scoring chances to win three playoff games, but still Saturday night’s Div. 1 South first round game against Plymouth North at Alumni Field remained scoreless through the full 80 minutes of regulation and then through another 10 minutes of overtime. At the start of the second extra period, Mansfield was facing a gusting wind and the looming pressure of a penalty shootout. Up stepped senior Luke Savoie, the team’s leading scorer this fall, to provide the game’s finishing touch. 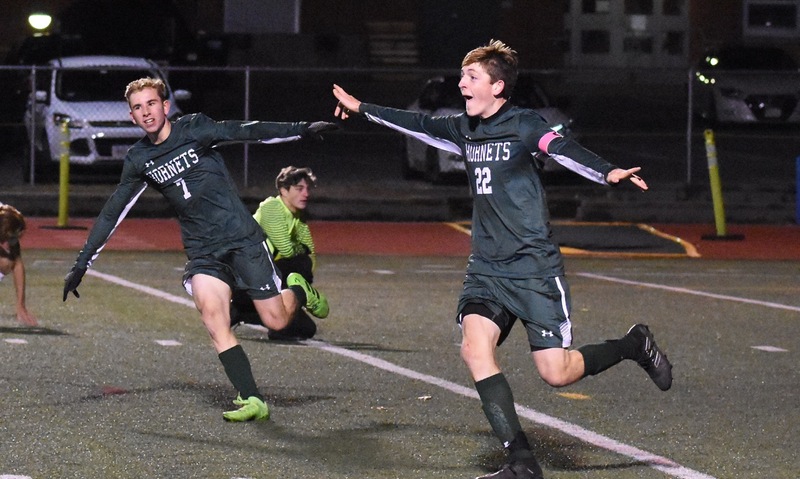 With one kick, Mansfield avoided the coin flip of penalties, avoided an upset by the 14th-seeded Eagles, and avoided the end of the Hornets’ season. Savoie beat his man to a ball over the top, dragged the ball through a challenge and came out the other side free on goal, the first time either defense had allowed someone to get a clean chance from the run of play. Savoie showed considerable composure, considering the circumstances, to coolly round the keeper and then make no mistake into an empty net. His golden goal, two minutes into the second overtime, lifted Mansfield to a 1-0 win and a spot in the South quarterfinal. There was little indication from the first half that the night would be filled with drama. The Hornets dominated the opening 40 minutes, holding the Eagles to one shot attempt (not on target), while creating a host of scoring opportunities with their trademark set pieces. Plymouth North had an early shout for a penalty when Brady Sorensen went down under the challenge of Derek Meuth, but the officials waved for play to continue. Just five minutes later, Mansfield was sparked into life by a rasping half-volley from defender Ethan Brill-Cass that was just tipped over by Eagles goalie Cole Gustin. A Savoie corner kick was headed past the post by Owen Mullahy at the midway point of the half and four minutes later Meuth hit a deep cross that picked out Ethan Scholes but the sophomore’s header was comfortably saved. In the 26th minute, a short corner freed Colin Caridi on the right side of the box and he forced Gustin into a save at the near post from a tight angle. On the ensuing corner, Luke Devine found the head of Mullahy but again the finish was narrowly wide. The chances kept coming for the Hornets. Savoie played in a corner to Devine at the back post but the slightest deflection by a Plymouth North defender was enough to take it away from the Mansfield midfielder before he could nod it into an open net. Minutes later, Mullahy got free on the right and played a low cross into Savoie, who had made a run across his marker, but the finish was over the bar. Savoie forced Gustin into a save just minutes after the restart and then had a second chance in the box blocked. While Mansfield continued to press for the opening goal, especially using long throws from Dylan Buchanan, it was the Eagles that had the wind at their backs in the second half and they started to make it a much more even contest. Despite the set piece prowess of the hosts, the visitors nearly used a dead ball play to take the lead. Defender Jack Post headed a corner over the bar and then minutes later hit a bullet free kick from 20 yards that was right at Mansfield keeper Anthony Salisbury. The best chance of the second half for the Hornets came in the 52nd minute when Devine got on the end of a knocked down header just inside the box. His shot was smartly saved at full stretch by Gustin (seven saves) to keep the game scoreless. In overtime, the Hornets got the wind at their backs agains and immediately went back to creating scoring chances. Mullahy headed the ball down to Savoie, but his finish went high over the bar and in the 88th minute Caridi and Buchanan got into each other’s way with the ball loose on the edge of the six-yard-box. The frustration was mounting for the hosts as the second overtime began, but Savoie soon allowed everyone at Alumni Field to breathe a sigh of relief. Mansfield (13-2-5) will host the winner of Brockton and New Bedford in the South quarterfinal on Monday. BOURNE, Mass. – It’s not often you get a second chance in a playoff game, let alone one that reaches 3-on-3 double overtime. But North Attleboro sophomore Brendan McHugh battled his way to a second opportunity and didn’t let this one past. 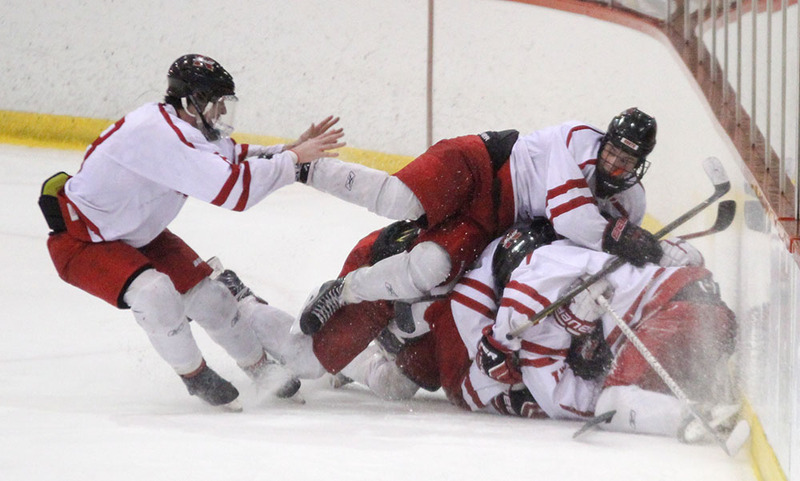 Just seconds after the defenseman had his breakaway turned aside, he tracked the puck down in the corner, got around an opponent and muscled his way to the game-winning goal on the doorstep to hand the fifth-seeded Rocketeers a 2-1 win over 12th-seeded Plymouth North. “I have pretty awful hands and I came in on a breakaway and I had no idea what to do,” admitted McHugh. “I tried to put it five hole but it didn’t work. I picked it up in the corner and they were kind of off me. With the win, North Attleboro advances to the MIAA Division 2 South Sectional Quarterfinals to take on the winner of Westwood and Plymouth South. “It takes a lot of character, a lot of poise, a lot of teamwork really,” said North Attleboro head coach Steve Snizek. “It’s about knowing your limitations and my guys, they did. They weren’t going to try to overextend themselves when they didn’t have a lot left in the tank. It takes a tremendous amount of self-awareness. The teams were knotted 1-1 after 45 minutes of play, sending the teams into a first overtime period played 4-on-4. While the Rocketeers had a couple of offensive zone trips early, the six-minute span really belonged to the Panthers. But for every shot, North Attleboro goalie sophomore Ryan Warren had an answer. He registered seven of his 26 saves in that frame to keep Big Red level. The Panthers also had a chance on a rebound but when the puck was chipped across the goal line, North defenseman Will Yeomans knocked it away over the top of the goal. North Attleboro went on the power play just over a minute into the second overtime period, playing with a 4-on-3 advantage. The Rocketeers nearly cashed in right away but Yeomans had his close range big go over the bar. After a scoreless first period – a frame that saw the Rocketeers dominate offensive zone time but register just two shots on goal – Big Red was able to break through late in the second period. Junior Jason McNeany dished the puck back to senior Vincent Zammiello at the blue line. The defenseman took a stride towards goal and unleashed a wrist shot. With plenty of traffic in front, the puck found its way through and looked to take a slight deflection off a Plymouth North player before finding the back of the net for a 1-0 lead. Plymouth North found the equalizer right around the same point in the final period. After a faceoff, the puck was played in front before taking a weird bounce with the Panthers’ Brian Kingsbury putting it in the back of the net late in the third. The two teams played nearly 10 minutes of extra hockey at either 4-on-4 or 3-on-3. North Attleboro (14-3-4) will play either #4 Westwood or #13 Plymouth South on Saturday at 2:00 at Asiaf Arena in Brockton.